Not every kitchen knife is constructed the same, hence why prices are so variable for quality cutlery. A quality knife has several essential parts, and once you understand why that component is important, you'll find it much easier to shop for a set of knives or a single sharp kitchen knife. Some of these explanations will in themselves, be the answers to your frequently asked questions. The knife's bevel refers to the blade's ground angle and shape. This is an important design feature and one to understand, especially when the knife requires sharpening. The bolster can extend all the way to the bottom or may be ground to enable full use of the knife edge when chopping, as well as, allow a complete sharpening of the blade. Because of the shape, it's easy to spot a knife with a bolster, so it's a good starting point when it comes to selecting good knives. The term Granton® is a copyrighted trademark of the original Granton® Company knife design. However, many knife companies tend to use the term 'Granton' to describe a particular knife blade edge, as illustrated on this featured Saber Chef's knife. A Granton® type of knife blade has a row of identical dimples or scallops that have been ground into each side of the blades of certain knives. Unlike a serrated edge, a Granton knife has a typical honed sharp blade edge, that can be refreshed with a knife steel or sharpened as needed. A Granton edge does not hinder blade quality, but rather enhances the knife's cutting and slicing performance. Once popular mostly on Santoku knives, this blade edge is now being used on many types including Chefs and paring knives. A Granton knife does look beautiful, but it's the enhanced slicing ability (reduced shredding), ease of cutting and better food release that makes this particular knife design so popular with professional chefs and home cooks alike. Knife manufacturers continue to look for ways to build on the smart Granton edge design, by applying it to different knife types and varying the angle of the dimples. A Granton edge is a great knife blade feature to look for when you're shopping for kitchen knives. You'll find a serrated edge of certain knife designs, including bread knives and utility knives. It's not so much that you shouldn't cut other foods with a serrated blade, but rather that it slices through certain food items much neater and easier. When it comes to slicing baked goods, a bread knife is the best. 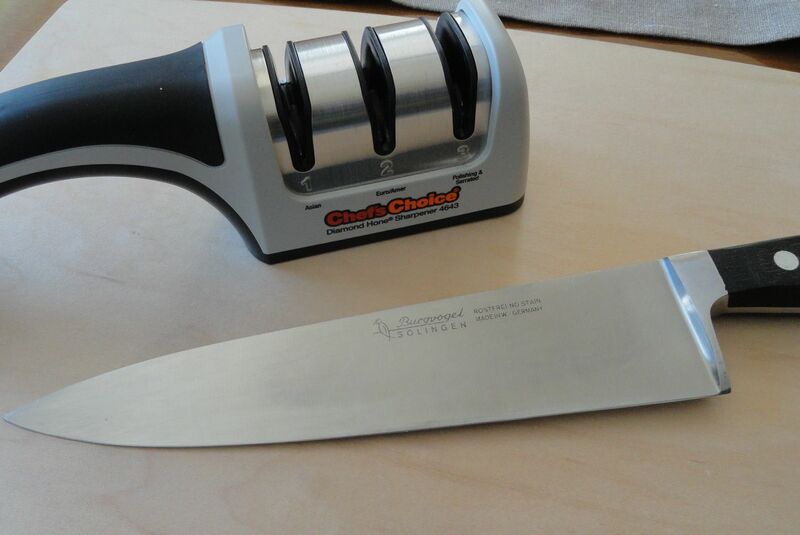 The serrated edge doesn't shred it and a long length is preferred especially for large loaves. Though most kitchen knives are steel, a knife steel refers to a specific tool for routinely maintaining the edge of your kitchen knives. It is however considered an essential for keeping quality knives sharp. If you're equipping your kitchen with professional knives, you need on. It's not so much a matter of whether a knife has a tang or not, but rather how long it is. A knife 'tang' is the continuation of the steel from the very tip of the blade to the end of the handle. The tang can be either 'full tang' meaning that it extends all along the length of the knife, or 'partial tang' extending only part way into the handle as a socket or file end. How long of a tang matters. The 'full' tang extension not only provides the best way of attaching the handle, but improves the weight and balance of the knife, plus adds strength and durability. When looking for quality kitchen knives, a full tang is a knife must-have. It's easy to spot a knife with a full tang, but viewing from the top, as shown. A child needs a nice properly suited for their small hand and equipped with special safety features. There are options available for the small fry and having an appropriately-sized knife is a great way to learn early, how to cut their food. A ceramic knife is a completely different breed of a knife and as such, does not have the same parts as a steel knife. Though this type of knife is excellent for cutting and slicing through some foods, it struggles with hard ones. Care is also altogether different. This is an important read before buying a ceramic knife. When shopping for quality knives, you'll often see specifications about the shape of the point and details on the grind. Here's what you need to know about these knife construction elements. Though everyday use will eventually dull a knife blade, certain things will be hard on these steel blades. Be proactive with care and your knives will serve you well for years. A Santoku is more about a knife design than a component, and since this type of blade is a consumer favorite, you should know why. They come in different sizes; you just may want one or two.